You practically expected Sarah Palin to wear a cape when she landed center stage Wednesday night. She was like a one-woman Fantastic Four, her faults invisible to the faithful, her strengths deployed to close a 20-point white-voter gender gap in key swing states, her blazing novelty enough to ignite the hall and her biography so elastic that everyone from the gun owners to the PTA moms to the Pentecostals to the first timers felt warm in the embrace. "Sa-rah! Sa-rah!" the delegates roared, and the hall that felt like a tomb on Monday might as well have seen the Second Coming of Ronald Reagan, so ecstatic was the crowd. The mood felt very different than it did during both the stunted opening night and the respectful valedictories of Tuesday. Now the speakers blared Everyday People as delegates felt license to dance (the Bushes had left; the storm had died away), and at any mention of energy policy, they erupted into chants of "Drill, baby, drill!!!" In place of the old white men, the podium featured a Latino farmer's son turned California state senator, impressive female CEOs and entrepreneurs, conservative black activists, apostate Democrats and, to deafening cheers, loyal Republican losers who raised the curtain on the surprise winner. There was Mitt Romney, arguing that "we need change all right  change from a liberal Washington to a conservative Washington!"  a transformational feat for the formerly pro-choice, progay rights governor of Massachusetts. Then there was Mike Huckabee, who thanked the media for unifying the Republican Party and praised Barack Obama's historic achievement before filleting him for his "ideas from Europe" and his willingness to "give madmen the benefit of the doubt." Rudy Giuliani, the veteran New York prosecutor doing part jury summation, part stand-up, swept swing voters into his arms and danced. He told McCain's heroic story yet again, but this time it was to set up a relentless contrast to the Ivy League guy who rose through Chicago-machine politics to reach the state legislature and vote "present" 130 times because "deciding 'yes' or 'no' was too tough" on his way to becoming a "celebrity Senator" who "has never led anything. Nothing. Nada." By the end Giuliani was ignoring the teleprompter, riffing his speech, eating into Palin's prime time, and the crowd loved it. 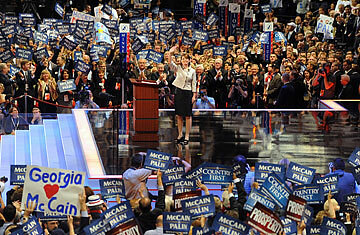 But it was Palin that the world was waiting for, at the climax of a media frenzy that Team McCain gleefully fed. Seldom has a candidate arrived for a showdown with curiosity so high and expectations so low. Earlier in the day a phalanx of powerhouse Republican women had gathered to denounce the "outrageous smear campaign" against Palin. They were "enraged," "insulted," "offended" by the questions raised about her qualifications or decision to take on the race while having five kids. Palin rolled right on down the tracks they laid. In a few short days, she said, she had learned that "if you're not a member in good standing of the Washington élite, then some in the media consider a candidate unqualified for that reason alone. But here's a little news flash for all those reporters and commentators: I'm not going to Washington to seek their good opinion  I'm going to Washington to serve the people of this great country." And the Louisiana and Georgia delegations waved their fingers at the men in the network skyboxes. Somehow her speech swelled from the 17 minutes promised in the morning to 37 minutes by nightfall; there was suddenly a lot to say for a woman who's had no choice but to make this up as she goes along. By the time she had gotten through her first two or three punch lines, it was clear a new star had been born, one who could go places John McCain might not even know exist and say things he could never confess. Presenting herself as a hockey mom turned local official, she stared down Obama's résumé. "Since our opponents in this presidential election seem to look down on that experience, let me explain to them what the job involves," she said. "I guess a small-town mayor is sort of like a community organizer, except that you have actual responsibilities." She talked with utmost respect about "Senator John S. McCain," as though she were describing a hero she'd once gotten to meet  which wasn't far from the truth. It's an archetypal tale she told: Mrs. Smith goes to Washington, the story of small-town, common-sensible people who love their country and know how things actually work, and if we'd just send them to Washington instead of the phonies and philosophers, it wouldn't be long before things were fixed. She'd already done it as governor, she said, looking after taxpayers' interests, selling the state plane on eBay, firing the governor's personal chef  "although I've got to admit that sometimes my kids sure miss her." The day's theme was "reform," which gave Palin a chance to sell the central premise of her presence on the ticket: that she's a fearless crusader willing to confront entrenched interests to serve the common interest. Liberals are bad because they grow government; mavericks are good because they weed-whack it. This is the story McCain wants to tell, and Palin is his wingwoman. "Here's how I look at the choice Americans face in this election," she said. "In politics, there are some candidates who use change to promote their careers. And then there are those, like John McCain, who use their careers to promote change." She spoke with far less respect of her opponents, showing that she was by no means reluctant to take a stick to what she portrayed as Obama's pretentions and presumptions. "This is a man who has authored two memoirs but not a single major law or reform  not even in the state senate," she said. "This is a man who can give an entire speech about the wars America is fighting and never use the word victory except when he's talking about his own campaign. But when the cloud of rhetoric has passed ... when the roar of the crowd fades away ... when the stadium lights go out and those Styrofoam Greek columns are hauled back to some studio lot  what exactly is our opponent's plan?" A campaign is partly a battle over images, and all candidates are greedy  they want to define not only their own image but also their opponents'. The acceptance speech is the only time anyone gets a clear shot at both. Palin hit her targets like a sharpshooter.